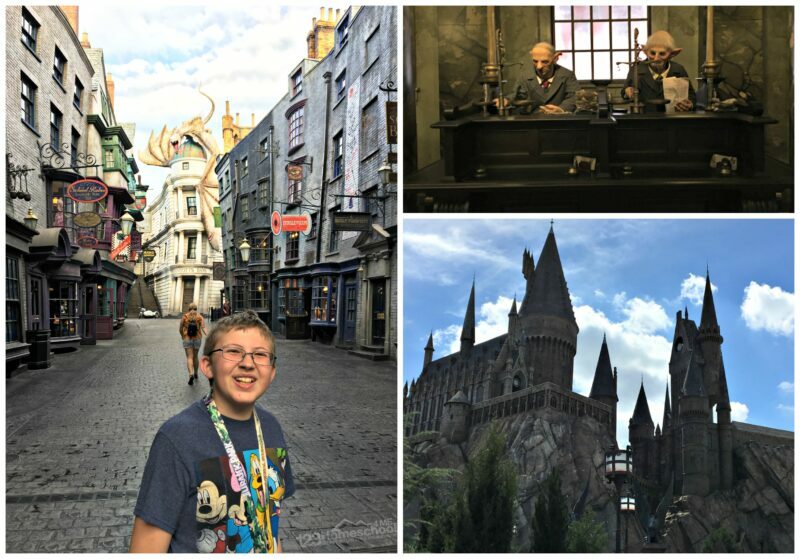 If you are busy planning your families next get-away to Universal Orlando, here are 5 tips you won’t want to miss! 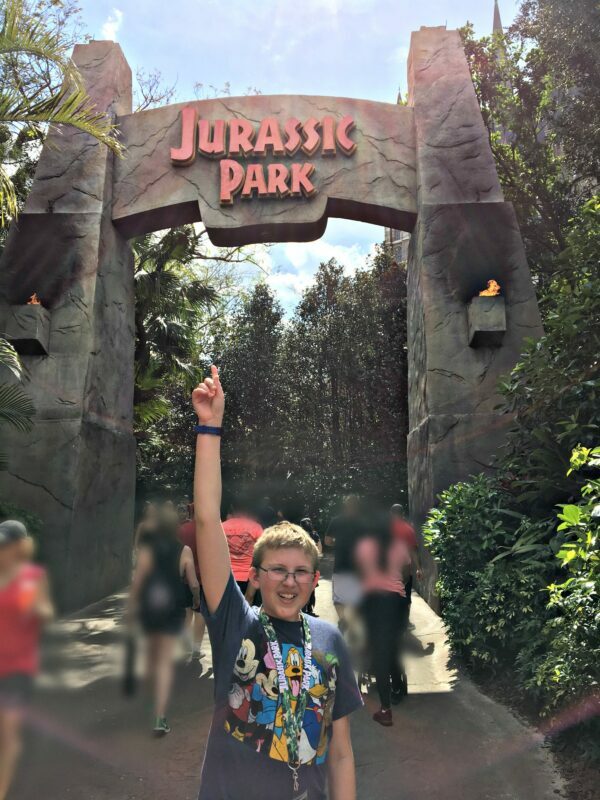 Our family received park tickets, hotel stay, and meal tickets in order to experience the amenities Universal Orlando had to offer our readers. No money changed hands. All opinions expressed below are completely our own and were not influenced by Universal Orlando. We only share things we believe our readers will be interested in learning about. 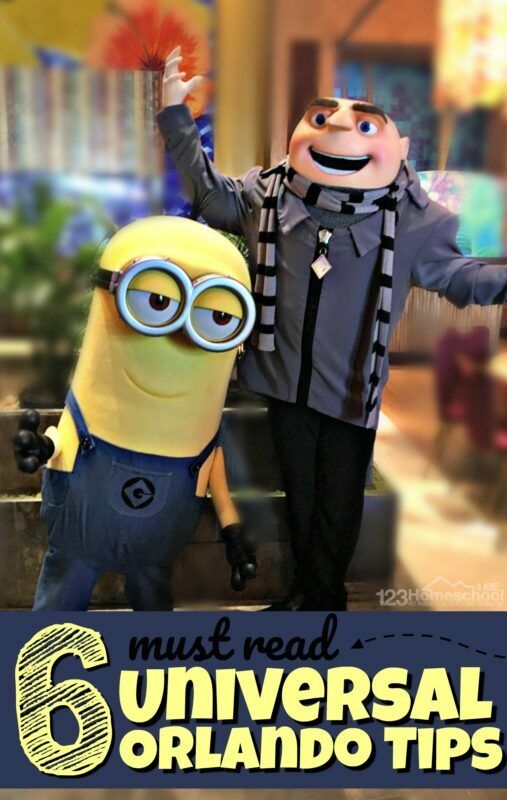 With over 52 things to do at Universal Orlando you want to read these tips so you have time to fit everything in! 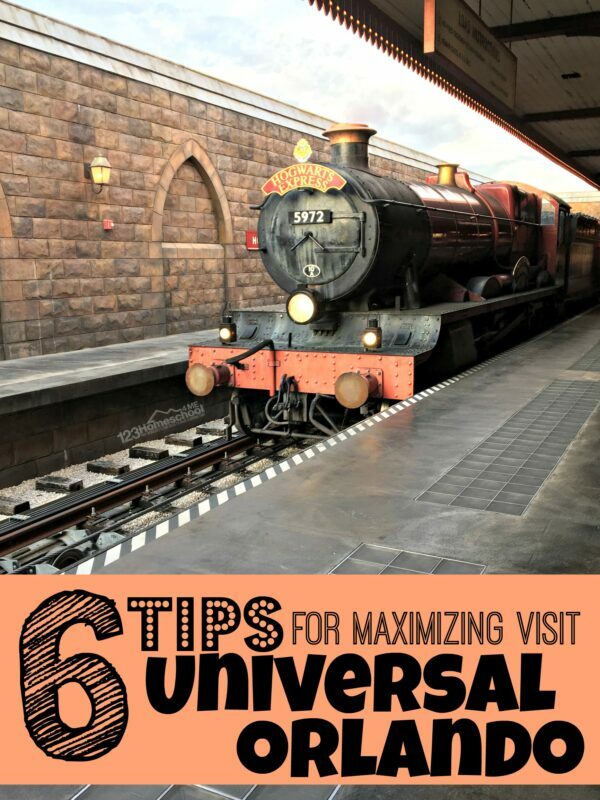 Staying at a Universal Orlando Resort is the best way to maximize your trip because you are close to the action! You wont waste any time driving or commuting back and forth to the parks. The resorts offer comfortable rooms in beautiful settings to help you truly relax and engage with your family. But my favorite reason is that staying at a partner hotel allows your group to get in to the parks 1 hour early! And believe me, with so many different rides and attractions, you are going to want that hour of extra time. Plus, during that morning hour, the park is only open to hotel guests so it is much less crowded. That allows you to basically walk right onto your most anticipated attractions like Harry Potter’s Escape From Gringotts in Diagon Alley. 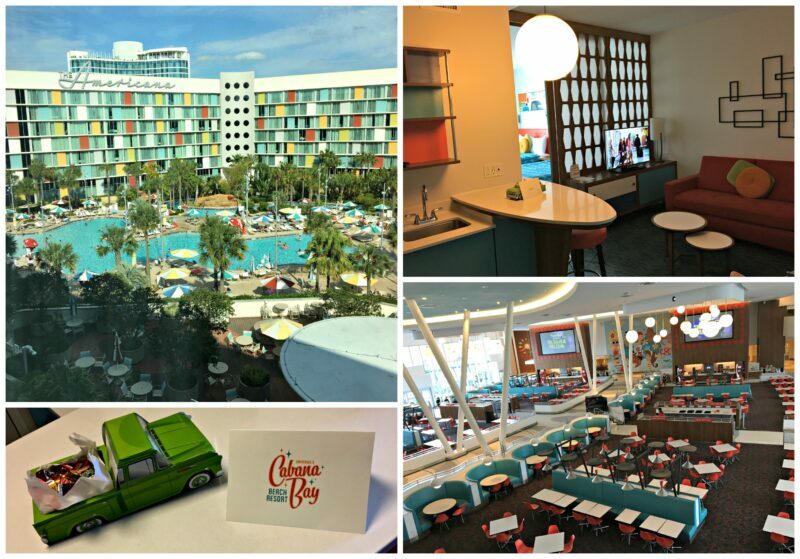 On our families most recent stay we were able to the beautiful Universal’s Cabana Bay Beach Resort. This resort is a true paradise and escape from daily life. There are two pools, a lazy river, water slide, bowling alley, arcade, food court, merchandise store, and even a Starbucks in the lobby. They have everything you need! There are a variety of rooms including these large family suites. We just loved the fun decor and spacious accommodations! 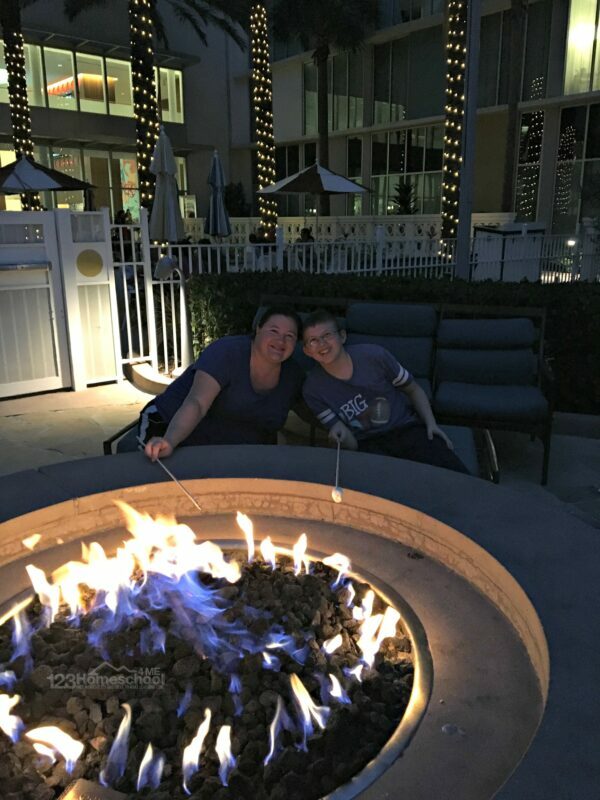 Plus when your family is done at the parks, 0r on the night you arrive, you can head outdoors to roast marshmallows on one of their outdoor firepits or catch a movie by the pool under the stars. There truly is something for everyone! Although each park has enough attractions to keep many families busy all day long the park-to-park pass allows Harry Potter fans to start out at Diagon Alley in Universal Studios Florida™ during morning extra hours then then take Hogwarts Express straight over to Hogsmeade in Universal’s Islands of Adventure™. Without a park-to-park pass you cannot enjoy this attraction! Hogwarts Express is not your typical train ride and is definitely not to be missed! I highly suggest starting your day exploring Diagon Alley in Universal Studios Florida™ during the morning extra hour. Then, right before Universal’s Islands of Adventure™ opens head over on Hogwarts Express to explore Hogsmeade before it gets crowded. And believe me when I tell you it WILL.GET.CROWDED! I briefly touched on this above with my suggested Universal Orlando touring plan, but you need to arrive as soon as the park opens. There are lots of other guests who will want to get on all the attractions you are looking forward to as well! Now if you follow my next (and most important) tip, it is a little less crucial as you will be able to get through everything. But if you want to see things without the crowds or daytime head you really want to start your day bright and early. HINT: If you need to take a break, consider going back to your hotel midday to enjoy your pool while the parks are the most crowded! The Express Pass is similar to Disney Fastpass, but way better in my book! The pass allows you to bypass most of the line (only waiting about 15 minutes) so you don’t have to wait over an hour in line – you get to go straight to the fun. 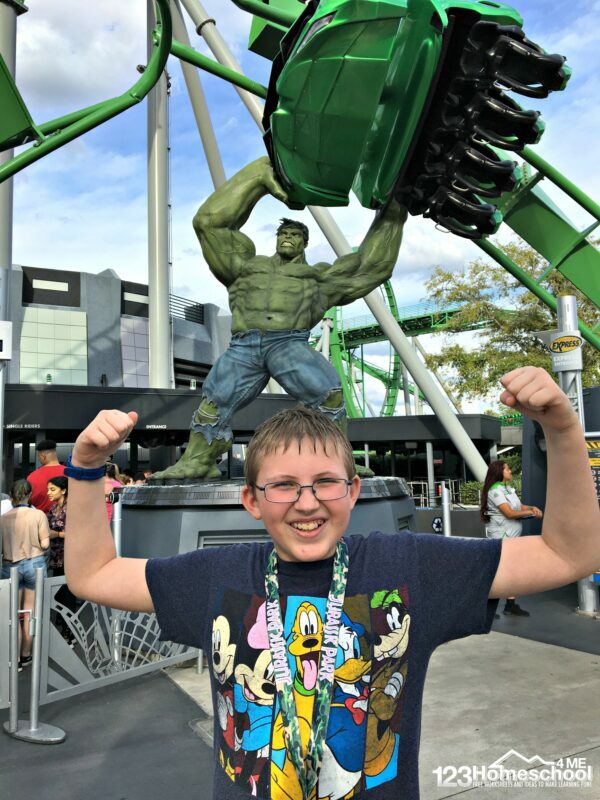 Unlike that other theme park in the area which limits you to a certain time, you can go on rides at Universal Orlando whenever you want! And if you get the Unlimited version you can on rides over and over as much as you want ALL DAY LONG! On our recent trip we road EVERY ride in both parks, had an epic character meal, watched the parade, and even had time to do our favorites a 2nd or 3rd time! Depending on which hotel you stay at it may be included – so check before you book your hotel. But even if it is not, this is a perk worth springing for if you have limited time! 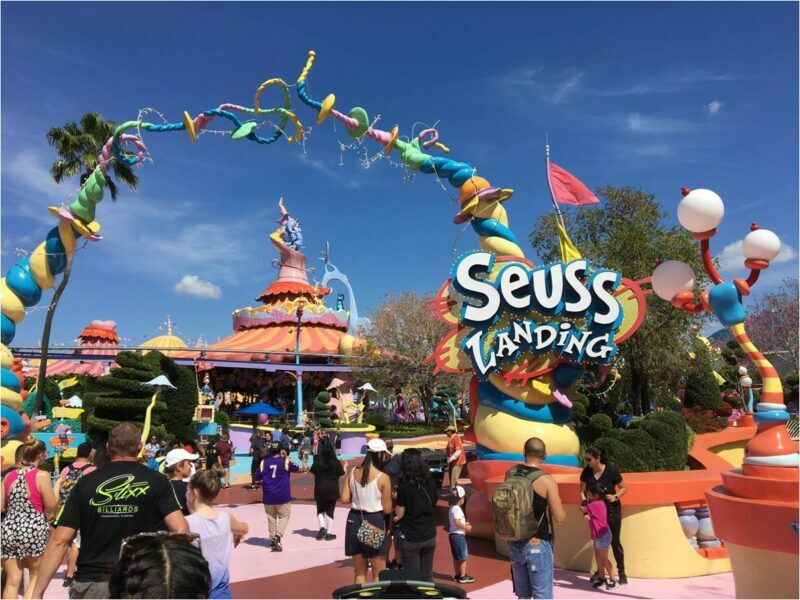 Universal Orlando strictly limits what guests can bring on a ride. Most rides wont even let you carry anything; some let you keep a cell phone in your pocket. And bags are a strict no. So what do you do with your stuff while you ride? The parks have lockers by almost all attractions which are free for use only when on the ride. They have a timing system that allows you to use them for the wait time plus a little buffer. So, why not just take what you want and use the lockers? Well, for one, they are SMALL. They fit your cell phone, wallet, keys, and sunglasses, but not much else. Larger lockers are available for a $10 fee. In my opinion, wear a lanyard with your ticket, express pass, and id/money in between. That and your cell phone will make it the easiest for you to get around. Movie fans will probably be chomping at the bit to get on all their favorite rides like Harry Potter, The Mummy, Men in Black, Jurassic Park, and more. 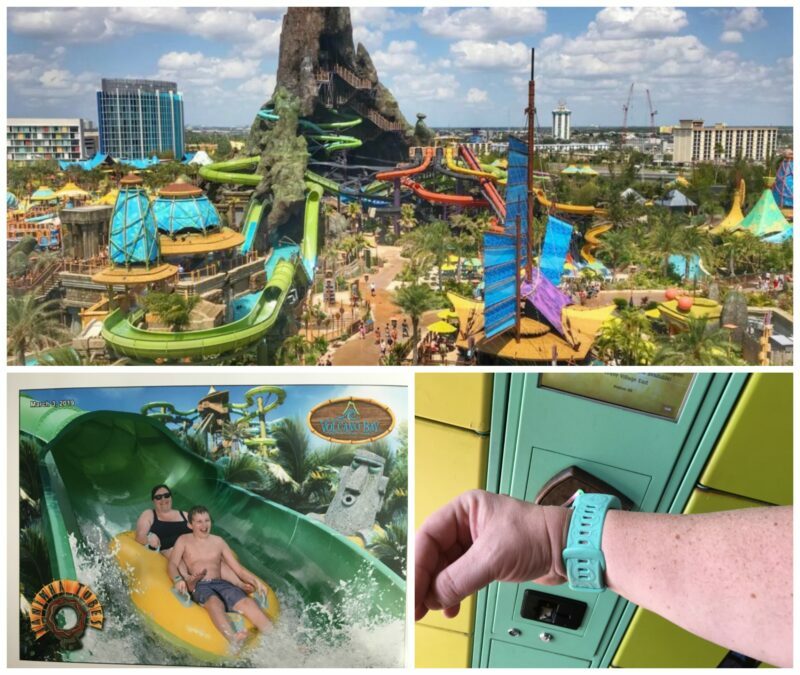 And they are pretty amazing, but you will be missing on an amazingly relaxing day if you don’t spend at least half a day (although you will want a whole day) at Volcano Bay. This stunning waterpark is my new favorite. The park is beautiful,well laid out, and has thrills for everyone. Our favorites were the large wave pool, River Rapids (definitely not a lazy river) and the aquacoaster. But there are certainly more than enough slides and activities to keep you happily splashing the whole day away. One of our favorite features was the TapuTapu. This super clever piece of technology is for your use free of charge. Wear your TapuTapu comfortably like a watch and use it to interact with self photo spots, activate water features, open your locker, charge food items, and most importantly – keep your place in line! So after tapping into our favorite aqua coaster we were able to enjoy the wavy pool until our TapuTapu alerted us that we could return to ride. SO CLEVER! HINT: If you stay at the lovely Universal’s Cabana Bay Beach Resort like we did there is a walking path from the hotel to the waterpark! Plus the waterpark opens 1 hour early for resort guests!